for Soil Testing - Particle size analysis of soils: Hydrometer method This equipment is used to determine the quantitative size distribution of very fine particle in soils such as clay and silt. The complete set comprises: 1. SEDIMENTATION CYLINDER, 1000 ml capacity (6 pieces) with rubber bungs. 2. SOIL HYDROMETER, 151H, range 0.995 to 1.038 g/ml with div. 0.001 3. GLASS TANK, dimensions: 600x300x380 mm 4. HEATER complete with thermostat, circulation unit. 230V Single Phase 50Hz 1000W 5. GLASS THERMOMETER, range 0 50° C., Sub-div. 0.5° C. 6. BEAKER, Borosilicate Glass, 250 ml capacity 7. Sodium Hexametaphosphate, 1000 g 8. HIGH SPEED STIRRER, 4000 R.P.M, complete with baffle cup, for dispersing soil particles in water..
We are leading manufacturers, suppliers & exporters of Particle Size Sedimentation By Hydrometer Method For Testing Lab for Soil Testing Lab. 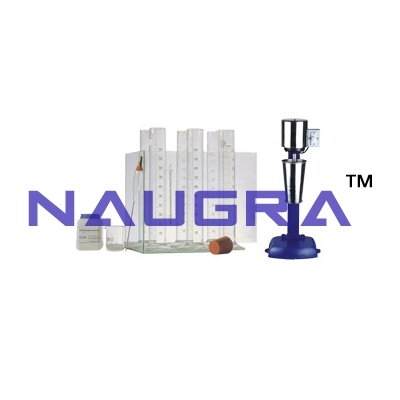 Contact us to get high quality designed Particle Size Sedimentation By Hydrometer Method For Testing Lab for Soil Testing Lab for schools, colleges, universities, research labs, laboratories and various industries. We accept bulk orders for government tenders in all countries around the globe.